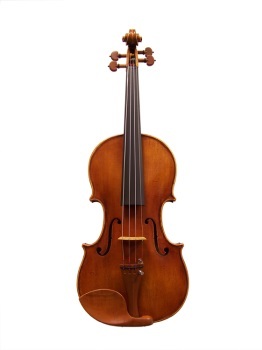 This violin is truly unique in its class. With a distinctive powerful tone this instrument is ideal for advancing players. The varnish is slightly antique and the fittings are typically boxwood. This is our most popular step-up instrument. Adjustment includes ebony fingerboard, boxwood pegs and chinrest, and a composite tailpiece with built-in fine tuners, and Pirastro Tonica brand strings.